My 12 year son made a statement that has helped my husband and I in fasting. He said, “If you just stop eating certain foods and don’t spend any time with God that’s a diet. A fast is when you stop eating certain foods and spend more time with God.” In other words, there must be a combination of abstaining and spending more time with God. I thought wow! I really needed that reminder, because I have been guilty of putting too much emphasis on abstaining from certain foods and not enough emphasis on prayer. Every year our family starts the new year by participating in a fast. Everyone makes a decision on what they will abstain from, and we hold each other accountable. It has been a blessing to our marriage, family and to our physical bodies. As we pray and fast, God has given us direction, wisdom, broken strongholds and given us insight for the new year. When we spend time getting closer to God it makes a difference in everything. There is something about fasting that helps us to hear God more clearly. 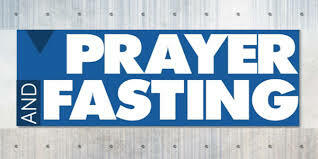 In fact, Matthew 17:21 says some things only happen through prayer and fasting. This scripture encourages me to fast, because I don’t want to miss out on anything that God has for me simply because I didn’t fast. I picture a special box with blessings that God has in store for those who are willing to deny their flesh in order to draw closer to Him. If you are going through something in your marriage, with your children, or having any issue and you desire to get closer to God, try fasting and praying about the situation. Pray about what you should abstain from and the length of time. Normally, it’s something that you enjoy otherwise, it would not be a sacrifice. If possible, connect with a friend or someone who will hold you accountable. Fasting is a spiritual discipline, and it is wonderful when you stay close to God every step of the way. We can stay close through prayer, reading God’s Word and worship as often as you can. God will change the situation, He will change you and sometimes He will do both. Although we start the month of January with a fast, fasting can be done at anytime. I recommend incorporating it into your weekly schedule and picking one day a week to pray and fast for your marriage, family and your children. If you are already participating in a fast, be encouraged to stick with it until the end. Resist the temptation to break your commitment to God. Remember that as you fast, the goal is to be more hungry for God than food. Fasting and praying is powerful!